The team managing Wiltshire College's Lackham-based unit work hard to run a dairy that demonstrates best practice in all areas. The current focus on young stock rearing has seen changes to housing, intervention timings and feeding with some impressive results. Sourcing labour is never going to be an issue at Wiltshire College's Lackham-based dairy unit. The mixed farm - which includes dairy, beef and sheep enterprises - is core to the studies of many students enrolled at the land-based arm of Wiltshire College. Students get involved in all aspects of work at Home Farm, from de-horning to silage making, as well as helping to milk the 170-cow Holstein Friesian pedigree herd. For stock manager Richard Ingram, who had been at Lackham for 12 years, the challenge is always to keep the unit moving forward, in order to provide students with best-practice examples of how to manage different farming enterprises. During the past couple of years, one of his priorities has been to improve calf-rearing management. And he's been focusing on making improvements with help from ForFarmers' account manager (and former Lackham student) Matt Green and calf specialist Ann Coombes. "We get together before calving begins each summer and talk about the aims for the current season and what worked, and what didn't the year before", says Mr Green. "Such a controlled environment provides us with opportunities to make real improvements and after focusing on the calves for the past couple of years, we are seeing some impressive results". "We block calve in the autumn so we always try to calve heifers at 24 months old", explains Mr Ingram. "But calf health has always been a challenge for us so we identified a number of important factors to help improve this". "First of all, we looked at the young stock housing - an obvious place to start. 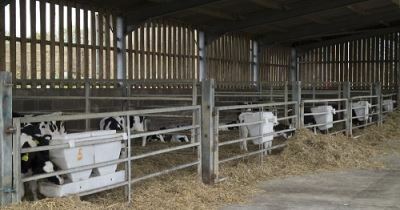 With so many different enterprises on the farm, calves were often housed wherever there was space. For a while they were housed in a block of old horse stables and i think the lack of ventilation really contributed to the pneumonia and crypto cases we encountered. "Secondly, the nature of our farm mean that bio-security is a constant challenge. We have many groups of students - many living on farms - who are working with the calves. So it's inevitable that our animals will be exposed to more pathogens than the average calf." Both these issues have been addressed during the past year. Calves are now reared in new purpose-built housing and farm staff are working much more closely with lecturers to plan practical sessions so that tasks, such as dehorning and naval dipping, are all carried out in one go. This reduces the overall number of times students enter the pens and also the number of different students that each group of calves is exposed to. Calves are weaned on weight, rather than age, and Mr Ingram is looking for calves to double their birth weight before weaning. So another area that he was keen to look at was the calf feeding regime. Not only would this save on milk powder costs, but it would also increase concentrate intakes in the early days. "The aim for us is to feed for health because rearing strong calves from day one is crucial for their future development", explains Mr Green. 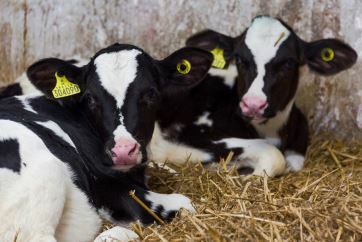 "By reducing the weaning age we can push dry matter intakes up as soon as possible, which in turn helps rumen development and future growth rates." "When calves are young, their feed conversion rates are high - a kilogramme of live-weight gain. But this ratio declines with age and so we are keen to capitalise early on and get feeding right from the start. If you don't think about growth rates until six, or even three months, then you've missed the boat in terms of reaching an animal's true potential." Following advice from the team, calves are now fed milk powder and calf pellets from ForFarmers' VITASTART range. VITAMILK Premium has a high inclusion of skim milk powder to provide plenty of energy and protein and both products contain a range of added extras to help boost health and immunity. "Considering the health challenges that our calves are exposed to, I was keen to feed a good quality milk powder that would boost calf health in the first few weeks", says Miss Coombes. After the intital tube-feed of frozen colostrum, of at least three litres, calves go strraight onto 360g of milk powder, twice a day, diluted at a rate of 180g per litre of water. There is a more concentrated feed rate compared to that fed in previous years. From day three they are also offered ad-lib calf pellets, as well as fresh water and straw. Calves move to once-a-day milk feeding later than previously - at five weeks rather than four. "In the past, once they were weaned, calves moved onto forage. But this year we are keeping it consistent and simple and feeding concentrate and straw. This is the first year that we have tried these higher feed rates and research shows that it should work. I am confident that we will see the results that we want" adds Miss Coombes. "Regular weighing to check growth rates is vital and we are keen that the next generation of calf rearers acknowledge this and see it as best practice. "We are now achieving an average first calving age of 23.8 months old" says Mr Ingram. "So far this season, calves are doing well. We are seeing animals double their birth weight by weaning, as planned, and their level of concentrate intakes at weaning are also good", she says. "We've been rearing the calves in the new buildings for around three months now and, so far, we've only had one case of joint ill and no cases of pneumonia or scours".